We held our first ‘extra’ FLaRN workshop on Friday 22 January 2016 in Swansea. 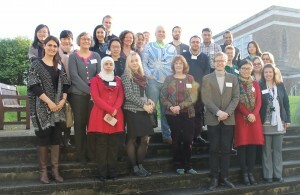 The Formulaic Language Research Network, FLaRN for short, which celebrated its 10th year in 2014, has attracted students and academics from across the globe to a practical workshop at Swansea University hosted by the College of Arts and Humanities, Swansea University’s Research Institute for Arts and Humanities (RIAH) and Swansea University’s Language Research Centre (LRC). “This workshop, as the FLaRN conference we organised in 2014, has turned out to be truly international,” said Dr. Fernandez-Parra. “We were delighted to welcome influential scholars from the UK but also from Sweden, Japan, Turkey and elsewhere.